No more kids that refuse dinner…and they wouldn’t even notice they eat such a healthy, full of vitamins winter dish! Veggies, legume and a slow cook method will provide you with a wonderful family reunion around the table, recalling grandma’s dishes. 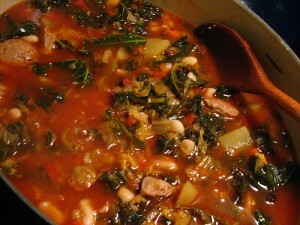 Though considered as a traditional and poor Tuscan dish, the Ribollita makes its great comeback to best restaurants. Look for it in your next visit here, and until than just cook it yourself. Soak beans in fresh water for the night. Boil it in 2 liters of salted water (1 spoon of salt). When beans are well cooked, drain it, keeping their water apart. mince 1/3 of the beans and re-place it back with the rest of the non minced beans. Chop well the onion, 1 carrot and 1 celery leave and fry them in a large pot with half a glass of olive oil. Clean, wash and cut all the vegetables into chunks. When the onion mix turns gold, add all veggies. Let it cook for about 10 minutes, covered with a lid, stirring and adding once in a while the beans water. When the green vegetables (cavolo nero and Swiss chard) reduce their volume, add the beans (minced and whole) with the water. Add the tomatoes and bring to boil. Reduce flame and let it cook for about 1 hour without covering the pot, adjusting in salt a pepper. Serving: roast lightly the slices of bread and scratch each one of them with a fresh garlic clove. Place the bread in the plate and purr soup above. Sprinkle with Extra Virgin olive oil and ground black pepper.